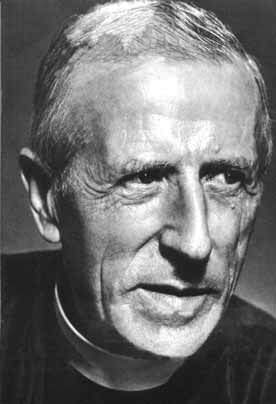 During his lifetime and especially since the posthumous publication of his writings the late Jesuit paleontologist and spiritual writer Pierre Teilhard de Chardin did as much to renew the faith of 20th-century Catholics and inspire non-believers as any single Catholic figure, with the possible exception of Saint John XXIII. Though not an apologist, he did more than any controversialist to reconcile faith with science and to teach scientists about the spiritual character of their work (see, for example, my article “With Teilhard on the Slope,” America, Dec. 13, 2010). But in his time, as David Gibson wrote on this blog yesterday (“U.S. Nuns Haunted by Pierre Teilhard de Chardin?” In All Things, May 22, 2014), Teilhard was seen as suspect by the Vatican and disciplined by his superiors. Despite the inspiration he gave to the eschatology, the theology of history and Christology of Vatican II’s “Pastoral Constitution on the Church in the Modern World,” later endorsed by one-time critics like Popes John Paul II and Benedict XVI, despite Saint John Paul II’s recognition in 1996 that evolution is “more than an hypothesis,” despite Pope Benedict’s appeal to Teilhard’s Eucharistic theology, some in the Vatican, I am told, still hold him suspect. But outside some narrow circles, his reputation is more than redeemed. It is endangered, however, by those who would invoke his name to bolster other theories of evolution, like Barbara Marx Hubbard’s “conscious evolution,” the philosophy, which Cardinal Gerhard Mueller, the prefect of the Congregation of the Doctrine of the Faith, charges is reason enough to question the faith of the Leadership Conference of Women Religious (L.C.W.R.). Of course, one can never control what is done with one’s intellectual legacy. Darwin’s ideas generated the perversities of Herbert Spencer’s Social Darwinism as well as a variety of now debunked eugenics campaigns. Teilhard, for his part, was distinctively Catholic. For one, if there is anything that distinguishes Catholicism from other forms of Christianity, it is centrality of the Eucharist to Catholic life. The Mass as an act of transformation of matter into the Body and the Blood of Jesus suffused Teilhard’s imagination. Likewise, Eucharistic adoration was an occasion for his prayer and for some of his mystical experiences. The Eucharistic liturgy, likewise, became in his essay “Mass on the World,” a paradigm of the transformation of matter into spirit and of our experience of God’s action in the world. Secondly, Teilhard’s faith was Christocentric. Unlike New Age thinkers, his evolutionary theory was made possible by the attractive power of Christ Omega. Evolution was so pregnant with meaning because it meant more and more matter was touched by the Incarnation. Teilhard, moreover, receives too little credit for helping Catholics appreciate the meaning of the Risen Christ celebrated by Saint Paul. The confession “My Lord and My God” might be depreciated by New Agers, but for Teilhard, who claimed he would never be drawn to worship the historical figure of Jesus, Christ in glory evoked reverent awe. Finally, and this may be the most difficult point for our contemporaries to comprehend, Teilhard treasured being a part of the visible church. The church, he believed was “a phylum of love” within history, and, despite the most passionate truth-seeking and intense mysticism, he surrendered himself to the church’s often wrong-headed and sometimes sinful discipline (think of John Paul II’s “sins committed in the service of Truth”). Today we have a profounder sense of human rights and of rightful self-assertion than Catholics did in Teilhard’s day. The church still has far to go to make its structures, law and judicial process match its confession of the dignity of women and men made in the image of God. Nonetheless, we can still learn from Teilhard’s love of the church and his docility in the face of misguided discipline. L.C.W.R. in its dialogue with the U.S. bishops, their real critics, and the C.D.F. exemplify the same patient love Teilhard did in enduring his silencing and exile. I appreciate this reflection but find the application of Teilhard's "docility" wanting. "Misguided discipline" against one theologian in the pre-conciliar era is hardly the same as the insulting language and implications leveled at the LCWR. Why don't we just cite Galileo's acceptance of house arrest even if he never really uttered "Eppur si muove." The call of discipleship can call for effective, humble protest as well, I believe. Fr. Christiansen, Speaking of Barbara Marx Hubbard you had this to say: "It [faith] is endangered, however, by those who would invoke his name [Teihard’s] to bolster other theories of evolution, like Barbara Marx Hubbard’s “conscious evolution,” the philosophy, which Cardinal Gerhard Mueller, the prefect of the Congregation of the Doctrine of the Faith, charges is reason enough to question the faith of the Leadership Conference of Women Religious (L.C.W.R.)." There is no reasonable logic in an assumption that Ms. Hubbard’s address endangered any one’s faith, let alone the faith of the entire LCWR. Teilhard as Drew Christiansen, S.J. says, “was distinctively Catholic,” thoroughly Christian, if I may add and as if to prove it, he prayed to die on Easter Sunday and God granting his wish, he died on Easter Sunday, 1955, in New York City. In his “The Phenomenon Of Man,” I learned as a young man how to “baptize” the theory of evolution, no longer just a theory, when on that topic he asserted, “God makes things make themselves.” Why is that still doubted by some? Clearly, as may be deduced from of all things, the Bible, God used and continues to use the “agencies” of persons, places, things, to accomplish his Will. Cosmological Evolution is one of the “things” God used and continues to use in his ongoing creation process. As a personal point of view, I believe Tielhard now joyfully resides in the blessed Land of the Living, there discovering how right he was and so I have no qualms in saying, Blessed Saint of God, Pierre Tielhard de Chardin, pray for us! Fr. Christiansen rightly points to the wide divergence between Chardin's "Christocentric" & "distinctively Catholic" work from those like Barbara Marx Hubbard who jettison much of the Christian kerygma in place of a kind of spiritual Gnosticism (in the words of Pope Francis). I wholeheartedly agree. But, doesn't that crucial distinction justify (at least in part) the USCCB & CDF's criticisms of the LCWR honoring Barbara Marx Hubbard? The LCWR honored her for her own theory of "conscious evolution" - not Chardin's. Hubbard's work presents deep divergences from Christian teaching; so why is it unjustified to criticize a group that honored her?